Intensely pigmented with a dark tomatoey red, opaque hue. Aromas of gigantic black fruit and loads of "stuff" going on! Tar, bold evergreen and spice, cigar box and more ripe berry fruit lurking underneath it all. Wow! Palate--Again, gigantic immense bold deep, dark berries with thickish, rich texture. Finishes with a lingering dark fruit with some charred oak. 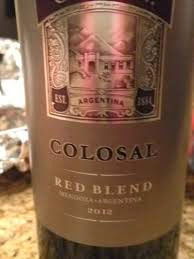 This "red blend" is Malbec, Bonarda, Syrah, and Cabernet Sauvignon. The Malbec and Syrah stand out to me but candidly I do not have a lot of experience with Bonarda. I paid $9 for this $16 wine marked down. This is definitely an upper teens value so raise a glass and enjoy it with something with plenty of heft!